Pardon while I curse, but HOLY SH**! HOLY, HOLY, SHELLYPIECE! LIKE A FREAKIN' OPTICAL ILLUSION OF AWESOMENESS! So it's safe to say that I adore Shelly's project. Heck, I adore everything she makes. Very inspiring. Like the kind of inspiring that doesn't make you say "I can't do that!" (Although, truth-be-told, it's nearly impossible to duplicate her awesomeness) but rather "I want to TRY that!" At the time I was busy editing a video, so later in the day, when I had barely finished painting and assembling my Tim Holtz Foliage pieces into cute little flower pops Shelly had already posted a photo of her finished project on Facebook! It is now on her blog and you can see bigger photos of Shelly's awesome doublehigh March tag card/album by clicking here. I am proud to say that, despite uttering a few "I'm not worthy! "s after seeing Shelly's, I still finished my project and am quite happy with it. The album in the closed position gives the closest approximation to Tim's tag. I used his Bunny & Bow Movers & Shapers piece and created the cute little flower pops using Distress Paints (so in love with these!) and his Foliage pieces. I painted white Distress Paint over the SEI patterned paper to tone it down. So easy, with great results! When the card is opened you see that it is actually three panels of the Accordion Album with bunny holes on pages 1-2 and a glittery silver bunny on page 3. To make the matching holes you'll need to do some work before assembling the album. Start by attaching the outer (square) frames for Pages 1 and 2. Add the patterned paper frame to Page 1 using the companion Frame & Label Bracket die, which perfectly coordinates with the Accordion Album die. Because you didn't connect the two small frames together yet, it's easy to now re-flatten the album to add Page 3 and do the rest of the decorations. 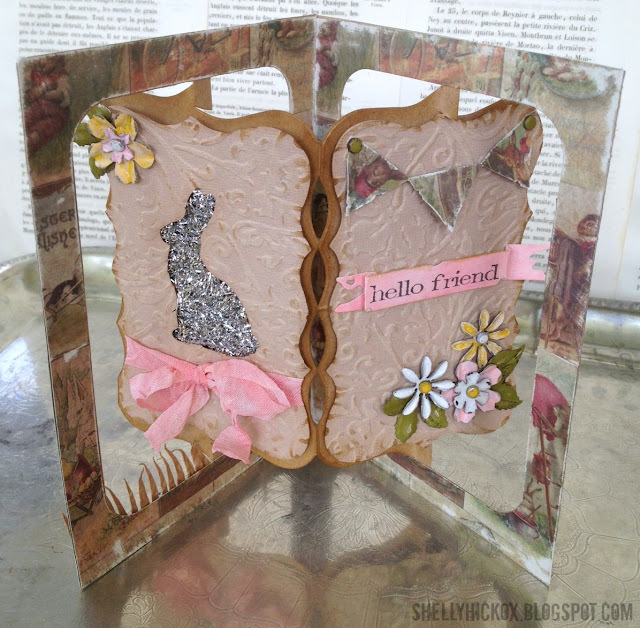 I'm going to send you over to Shelly's post to get supply links for the Tim Holtz products. This way you can use her coupon code and get a great deal. I'm sorry to say that the Accordion Album and Frame & Label Bracket dies have already sold out at Inspiration Emporium. Check your local Sizzix retailers to see if they have the dies, or the album die appears to possibly be in stock at Blue Moon Scrapbooking HERE. BTW, you still have a few days to get your projects in for the Inspiration Emporium Add a Little P.O.P. challenge. Happy crafting! You may recall that I participated (and made a mess, and had a blast) in the Tim Holtz 12 Tags of Christmas last year. You can view my tags here - Karen's 13 Tags of Christmas (Yes, 13. I'm an overachiever, yo!) Nowadays you can make one tag a month, so you don't have to neglect all your festive baking just because your pans are being used for shrink plastic and photo transfers. One tag a month ought to be a pretty easy feat, except that I am 0 for 9 on January thru September. October is my favorite month for stamping, though, so I really wanted to make time to create something using some of my favorite old (and new) Halloween stamps. I was going to make a Pop 'n Cuts card, but then I saw Shelly Hickox's October Tag and it struck me that I could use my bird skeleton on the front of a pop-up tag and then have it open to reveal a suddenly reconstituted raven, Zombie-style! Brilliant! I started with the basic techniques that Tim teaches in his October Tag Tutorial. I cut my new Frame Label die and coated it with glossy accents. Instead of using black glitter I mixed together some orange glitter and black seed beads. The frame is hinged to be able to open. I backed the opening with a stamped Bird Skeleton. First I stamped and embossed the bird on glossy cardstock. Then I used a Stampscapes Tonal Applicator to blend in a few colors of ink. A quick spritz of water, blot the excess, and my mottled background was done. I used a Sharpie white paint pen to color the skeleton. The 31 numbers are from the Tim Holtz Gothic Boo die that he uses on his tag. I cut the numbers from black shrink plastic and shrunk them. I found a metal hardware pull in my stash and used it at the bottom of the frame. When the frame is opened, a Pop 'n Cuts circle label pops up, adorned by a Zombie raven. (Because he was dead just a minute ago, you see.) The raven is stamped and embossed and glued to the front of the PNC. I stamped the word "Nevermore" and distressed the edges. It may not be readily apparent from the photos, but I did make Tim's tissue paper background for the tag. I used sparkle Mod Podge as my glue and some dark stained tissue. After finishing the background I discovered some black netting in my stash and though it would look nifty over the top of the tag. The Raven quote is stamped and embossed on my new Fancy Frame die and then attached to the tag with black brads. I tied a couple of ribbons through the top of the tag and then added the bones charm. It seemed fitting! So there you have it! Many thanks to Tim Holtz and Shelly Hickox for all their inspiration! 13th Tag of Christmas - distressed lady indeed! Now why did this distressed lady forget about the water being off? Because yesterday, while I was trying to replicate a china doll, I went outside to spray said china doll with sealer spray but neglected to bring anything outside with me to spray it on. As I was standing there a worker from the Water Dept. walked up and handed me this flyer to inform me that the water would be off all day today. Do you see that light spot on the flyer? The one indicated by the bamboo skewer? That's the outline of the china doll. I said "Thank you very much!" to the Water Dept. worker and gleefully put the flyer under my china doll and started spraying. Did I read the flyer? The other night, after Tag #10, I needed a clean surface to film a promotional video for my new product release at CHA. (See? I do other stuff, I promise!) As I was putting away the "Distressed Ladies" stamps, I decided to give them a quick kerchunk and make a bonus tag. The title of my bonus tag is "SHOPPING, SHMOPPING . . . AT LEAST MY TAGS ARE DONE!" And now I have to go find a baseball cap. I totally DID IT! Whew! Twelve days of messy intense crafting, using tools from my studio, tools from the garage, supplies from the storage room, supplies I didn't remember I owned, etc., etc., etc. But I DID IT! I finished the twelve tags. I mocked the tag background with stamps, tissue and sparkle Mod Podge. I mocked the tissue flower by stamping on plain white tissue and then following Tim's instructions. I decided the one in the middle, the girl, was my Huckleberry. I loved that she was already missing an arm, which seemed to fit with the overall feel of Tim's tag. I ripped off her hat, scarf and the little wooden present under her arm and painted her white. After she dried, I realized that she was going to be too thick for the tag. She needed to be chopped in half, but how dedicated was I to this project? Was I willing to get out a jigsaw and clamp her to a saw horse? I mean, come on! I thought perhaps a hand saw, if we had a small one, might do the trick, but then I saw these garden shears in the garage and thought . . . would they work? They worked! Beautifully! A couple more coats of white paint and then a generous spraying of Krylon Glossy Seal Coat turned her into my china doll. Next I focused on her wings. I knew I had some Tim Holtz charms . . . but the wings had already been used! Aww man! I turned back to my trusty shrink plastic. I die cut the wings from Tim's Heart Wings die out of white shrink plastic and then ran them through an embossing folder to texturize. I shrank the wings (used my heat gun because I'm lazy with the oven) and then highlighted the texture with a silver leafing pen and some black Staz-on ink. They turned out to be the perfect size! I used hot glue for most of the tag assembly. Here's a link to Tim's Tag, which has all the instructions for the flower and the layered title letters. Am I channeling my inner Tim or what?! Today's technique is shrink plastic and I totally used shrink plastic on two previous tags! And this thrills me because, yada yada, I had the same idea as Tim and that makes me totally cool, whatever, but more importantly - NONE OF IT HAD BEEN PUT AWAY YET!!! Do you see how being messy is a gift? Could you explain it to my husband? Now I know what you're thinking: "That looks not a bit like Tim's, Karen. And didn't you say, Karen, that you were trying to duplicate his designs as close as possible without going shopping? Didn't you say that, Karen? Hmmmm?" OK, yes, I said that. Let me just explain. . .
No, it is too much, let me sum up . . . It's like a fire has been lit inside me, (thanks, Tim!) rekindling my love of stamping techniques from days of yore, and, well, I just gotta be me. So now, since I went all rogue and such, I have to explain how I made this tag. I decided to make a snowy scene for my tag, so I used my Pop-up Snowflake die (retired) and cut it out of white shrink plastic. I dunked it in the melting pot of UTEE just like Tim's video (his tag is linked at the end of this post) and then, while the UTEE was still hot, I dumped fine glitter over the top. Repeat. I stamped the scene onto white shrink plastic using StazOn ink. If you're using clear shrink plastic, then it's easy to line up the stamped image over the die because you can see through it. In my case, though, I needed another way. I cut a piece of die packaging to the dimensions of a Bigz-size die. (5 3/8" x 5 7/8") Then I made sure that the edges were aligned with the edges of the die when I cut it. Now use the rectangle piece as a template to trace the die shape onto your shrink plastic, centering the scene inside the window. Cut on your traced lines to make the shrink plastic the exact size of the die. Now you can simply align the edges and run it through your machine. Use colored pencils to add color to the scene. Don't worry if your colors don't seem dark enough - they will intensify when the piece is shrunk. Make sure you punch holes before shrinking, too. Use the large hole on the Crop-a-Dile and it will shrink to the size for 1/16" eyelets or tiny brads. Shrink the piece in the oven at 325 degrees on a cookie sheet. Yes, you can shrink plastic with a heat gun, but a piece like this will curl over the top, stick together, you'll shout out some choice curse words, then burn your hands trying to wrench it apart again, then throw it away and start over. Now you might be wondering why I shrunk this piece in the oven instead of using the UTEE/melting pot method like on the snowflakes. I did try it, but the scene got very muddied and hard to see under all the UTEE, so I had to return to the old standby - the oven. However, I did want to get that glossy sheen on top, so I used Glossy Accents. Glossy Accents takes an age to dry. I'm the type of crafter who uses a heat gun because pre-heating the oven takes too long. Even after showering and eating breakfast I kept getting little thumb prints in the Glossy Accents because I touched it when it was still tacky. In the end, I had to add Stickles around the outer perimeter to hide my thumbprints, but I liked the way that looked, so bonus! Now let's talk about the tag itself. I started by following Tim's directions to distress the tag. I used greens instead of blues, but otherwise was a good student. I had a crack in my tag so I thought I would disguise it with a little greenery stamp that is, in fact, OLDER than that Stampendous stamp. But once I started stamping . . . I just didn't stop! The secret to getting this look is to keep rotating the stamp and get three kerchunks out of one inking. Alternate between two ink colors as you go. At this point it hit me that what I wanted was a "snow on the cedars" type of look for the background of my tag. I turned to one of my favorite Stampscapes stamps. The stamp wasn't tall enough to cover the whole tag, but I knew I was going to be putting my shrink plastic charm on the tag (if it would ever dry, already!) so I just stamped the tree trunks four times as shown in the photo on the left. On the right was my makeshift way of getting snowballs into the scene. My Crop-a-Dile was still out, along with scraps of die packaging from the earlier template. So I just punched both sizes of holes randomly through the plastic and then sponged white paint through it to get the snowballs. Now I was ready to put my whole tag together. I stamped and embossed my greeting at the bottom of the tag. Then I die cut a banner using the Tim Holtz Regal Crest die from woodgrain paper and distressed it with inks. I folded the ends under, accordion style, and then used the Tim Holtz Tiny Attacher to secure them in that position. And then, finally, my shrink plastic charm was dry! (ish) I attached all my components to the tag using tacky tape and then tied some pom-pom ribbon through the top. Here is a link to Tim's Tag #11, where you can find instructions for the UTEE shrink plastic (my snowflake charms) and the original tag background (under all that greenery and tree trunkage). I've also included a link to the Stampscapes stamp. ALSO, returning for a second to my own product line that I have been woefully neglecting over the past 11 days, don't miss the chance for a SWEET SALE on some of my pop-up dies at Scrapbook.com! Today only! When I saw Tim's Tag #10 this morning I was instantly thrilled. Remember how I posted this old tag yesterday and mentioned that it was a photo transfer? I actually wrote an article years ago for Creating Keepsakes magazine on photo transfers, (she says, importantly) but I can't remember what issue or anything. It seems like maybe they reprinted that article in one of those big idea books that you can find at Michaels, but really, I'm way too lazy to go find it. So you'll just have to trust me that I used to know what I was talking about when it came to photo transfers. The tag above is not a packing tape transfer but a kill-your-brain-cells blender pen transfer. And guess what? I STILL HAD ONE OF THOSE CHARTPAK BLENDER PENS IN A BIN SOMEWHERE! It didn't take me long to find it. I decided that I would find some Christmas sheet music online, mirror image it, print it on my laser, and then do a blender pen transfer for the background of my tag. Tim's technique for the Fragments was to do packing tape transfers, so I figured it would be fitting. The above picture shows just how much sheet music I was able to transfer to my tag before my stupid blender pen ran out of juice. For my packing tape transfers, I rummaged through my Christmas paper bin and found a very old piece of Debbie Mumm paper. I also grabbed the K&Co. vellum, just because I thought it was pretty. I didn't end up using it, though. I made packing tape transfers of the tree and reindeer for my Fragments tags. (Full instructions on Tim's blog, linked at the end of this post) Instead of foil behind them, though, I used kraft paper. I also brushed Sparkle Mod Podge along the edges. I trimmed the finished greeting close to the edges of the letters and attached it to my tag. EDITED TO ADD: Berta asked to see a photo of my stamp case labeled "People- Cannibals" so here it is. I really only have two actual cannibals. The other two stamps are accessories - the boiling pot and the swampy jungle. You know, to set the proper scene! Heh. Well lookie here! I'm posting a Tag on the actual day of the tag! I used a B Line Designs stamp (SE311G Romantic Swirl, Lg) to make my background using the double-embossed technique that Tim explains on his blog. My letters were cut on the eClips. I must say that I am thoroughly enjoying this 12-Tags project! I'm learning new techniques from Tim, and I'm digging into supplies that I haven't pulled out in years! My apologies for not posting this yesterday. Emma had her Holiday Band Concert last night. They sounded fabulous! It was amusing to be reminded of how I organized these stamps years ago into CD cases. I mean, apparently I can fill an entire case with "People - Women Distressed"! And let me just clarify something - "distressed" does not mean these stamps have grungy edges. It means that the women are, in fact, DISTRESSED! The other case that made me look was the one labeled: "People - Men Leaping". Really? Did I really fill a case with leaping dudes? ...10 Lords a Leaping, 9 Ladies Screaming . . . While I'm in a nostalgic "blast from my collage-y past" mood, I'll share a few old tags (circa a decade ago) that I came across while rooting around in the storage room for Christmas stamps the other day. That blue one is a photo transfer! Good times! I did it! I caught up! I mentioned in my last post that my goal is to replicate Tim's tags as close as possible without doing any shopping. It's not that I'm against shopping (as if!) but I'm trying to create these tags while still paying attention to my other duties and I know that by using things I have around the house, I can be multi-tasking while paint is drying, etc. One thing I already knew was that I didn't have the foil sheets I would need for Tag #6. I had debated between aluminum foil and some press-on foil (circa a million years ago) but hadn't decided yet. Instead, I turned my focus to Tag #7, which required another supply I didn't have. Tim posted a wonderful video on how to use his Kraft Glassine paper and by the 6 minute mark I knew I had to have some. And in all seriousness, I will buy it. The next time I am at the store and/or filling an online cart, that Kraft Glassine stuff will be MINE! But with regards to today's task of finishing two tags without leaving the house, I was going to have to figure out some way to replicate the look with stuff I own. The first thing I thought was that the cracked appearance of the KG paper resembled sandpaper when you fold it. A ha! Perfect - I would use sandpaper with a combination of gunk and get it to resemble the KG paper. You will see in the above photo that I combined walnut spray with alcohol ink and Perfect Pearls to create a not-too-shabby patina. Brilliant! This was going to work out well! First of all, crumpling the sandpaper hurt . . . a lot! Second of all, with all that gunk all over it, no crease marks showed up when I crumpled it. Third of all, how was I going to sand sandpaper? Well obviously with a piece of wood! Off to the garage I went. Then came another conundrum - should I put sandpaper through my Vagabond? Oh hello no! I wasn't risking it. Better just cut the holly leaves from cardstock and use them as templates to hand cut the sandpaper. And then, after all of that, I didn't think they were green enough. *sigh* I added some Luminarte paint. I could have run to the store and back at least three times by the time I had holly leaves that would work. Next I turned to a much easier replication - making the pearls with wire loops to be the holly berries. I had pearl beads and head pins, but my head pins were coming through my bead holes, so I needed a stopper bead. My tiny beads are in a container on the top shelf of a cabinet. I had to get a stepstool. But like a Christmas miracle, I found something tucked into the back of that cabinet that I did not remember I owned . . .
FAUX METAL SELF-ADHESIVE SHELF LINER!!!! I now had everything I needed for Tag #6. I didn't have the particular Texture Fade that Tim used, but I had the Patchwork Texture Fade, and I knew it would look just as cool. I hated to waste all that pretty leftover paint, so I plopped the leftover glossy cardstock right over the blobs and started shmearing. Tim Holtz is my Obi Wan. Yes, that would make a great t-shirt slogan. You're welcome! I didn't care about the mismatched metals because I was painting it anyway. Once the Glossy Accents dried I just followed Tim's instructions for painting, sanding and embossing it. My Tag #6 thrills me. My Tag #7 is very "meh" in comparison, but I'm posting it anyway. After the work that went into those stupid sandpaper holly leaves, I'm displaying it with pride! The pride is in the survival of the process. Tim's Tag #7 is awesome. But mine . . . not so much. Why does my torn lace look like a used bandage? His looks so nice! Below you will find the links to Tim's tags with wonderful instructions and supply lists. I think my Tag #7 is a clear illustration that with a little creativity and ingenuity . . .
. . . plus a little gas and a credit card . . .
you can (and should!) buy the proper supplies! I am attempting to get caught up on the 12 Tags, so here are my #4 and #5. Now I know that part of the challenge is to be "inspired" by Tim's tags and make your own versions, but really, I'm having more fun trying to replicate his tags as close as I can using products on hand. (Well, I did go buy some cranberry alcohol ink for Tag #5, but that was on my list anyway!) I think his designs are brilliant and I am going to love having a set of tags that look a whole heck of a lot like his! For Tag #4, I had the die, so that helped considerably. I had to improvise my background using Tim's "dredge the tag through the muck on the craft mat" technique but my "muck" was a mixture of acrylic and Luminarte paints. Took a few dredges and spritzing and such, but I was happy with the result. Having no bird on hand to pluck feathers from, (WHY?! Why don't we have a bird?) I improvised with a fringed fiber for his hat. The snowman is cut from pre-embossed grungeboard, circa a long time ago, then painted with Luna Lights (circa older than the grungeboard), and then coated with Crackle Accents. I have fallen in love with Tim's technique on Tag #5. Alcohol inks on the back of thick acrylic, then overstamped in black, then the black wiped away with a rag, which takes the alcohol ink with it! BRILLIANT! I loved the look of his word stamp, but I didn't have it, and there was no way I was creating words and then using a reverse-image stamp to get them onto the back of the tag. Instead, I was able to use one of my new Dina Wakley art stamps. I adore Dina and her work (and her humor, but not her way with animals) and I figured her grungy art circles stamp would look perfect behind the wreath. Here are links to Tim's Tags #4 and #5, where he has posted full instructions and supply lists, plus a link to purchase the Dina Wakley art stamp, if you are so inclined.